Beijing Sunlay Design’ s proposal for the Yellow River Hotel of Jungar Banner. This building stands with a building area of 44560 m²above ground and has a building area of 23644 m²under ground, which adds to a total building area of 68204 m². “Everything I saw standing on the site was strong contradistinction created by the confrontation between the endless desert and the yellow river which is full of vitality”. It occurred to the architects that given with this unique environment this building massing should be something extremely geometric. Like the pyramid standing in the desert, this building should be breaking the horizon and blending into the landscape, in which way architecture and environment will strengthen each other. 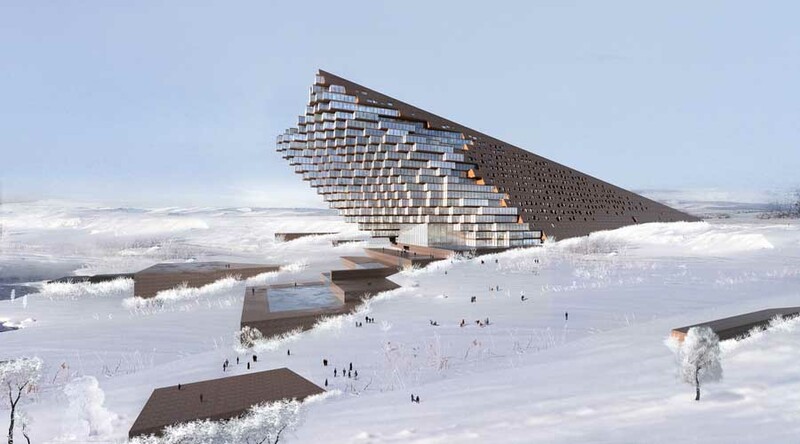 Finally, building concept came out as this: a gigantic piece of rock breaks through earth and rise on the site. While experiencing years of rain and storm, the weathering rock became a statue of history. Located on the spot where the desert, wetland and yellow river met each other, the biggest challenge for this project is to find a way to deal with the relationship between the building and environment. Architects solved this problem using the following methods. Landmark: using simple and geometric massing which distinguish the building from nature to create a dominate symbol on the site. Blending: Taking local stone as main material, this building represents a similar color tune and texture with the desert, which makes the building a gigantic rock standing on the site. Strengthening: The building and environment are strengthening the character of each other. Sight: The building will not block the view to the yellow river according to visual analysis. VIP rooms on the east get the best view to the yellow river. Tactile impression: experience of the building is enhanced while visiting the building by using the combination of different spaces, materials and scales. This building stands on the spot where you can overlook the yellow river and the wetland faraway, in which circumstance the principle of design is to optimize the view while standing in the building. Interior landscape runs to the outside and connect the exterior with interior. The cladding on the east part of the building represents full transparency and low energy consuming. 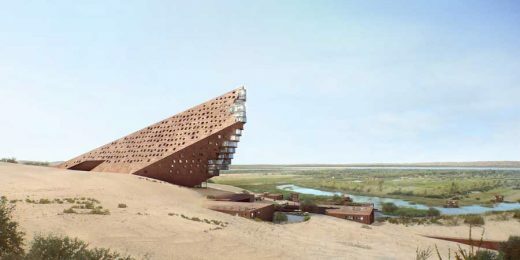 As the VIP rooms stacking together like crystal till the top, a huge dining hall is placed here, where visitors can overlook the intersection between the wetland and the desert, the yellow river is also flowing far behind. Conference center and exhibition center is built along the landscape, introducing natural element into the building.